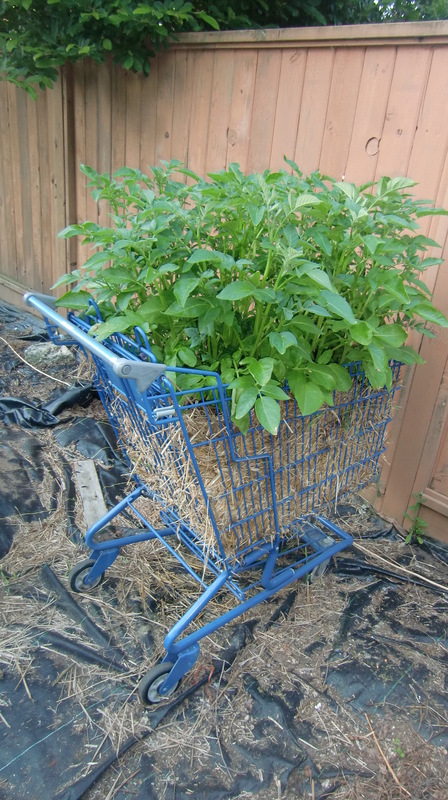 The Gro-Carts Project is a story about how one blue grocery cart inspired people to grow their own vegetables. 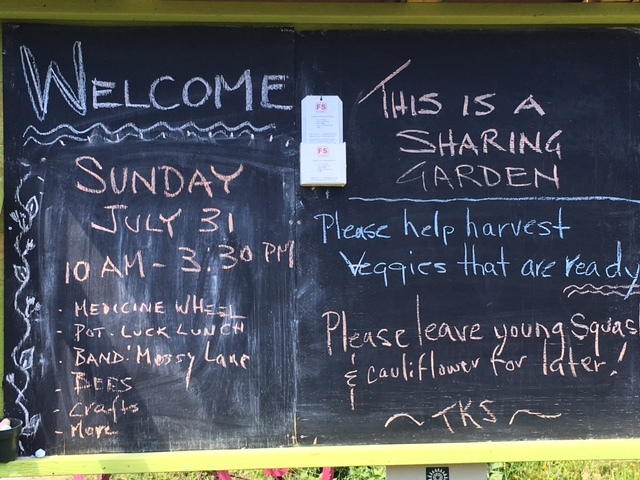 Our participants planted and harvested 21 carts, and consumed hundreds of vegetables. — If it hadn’t snowed in December, many of our Gro-Carts would still be feeding us cabbage and kale! 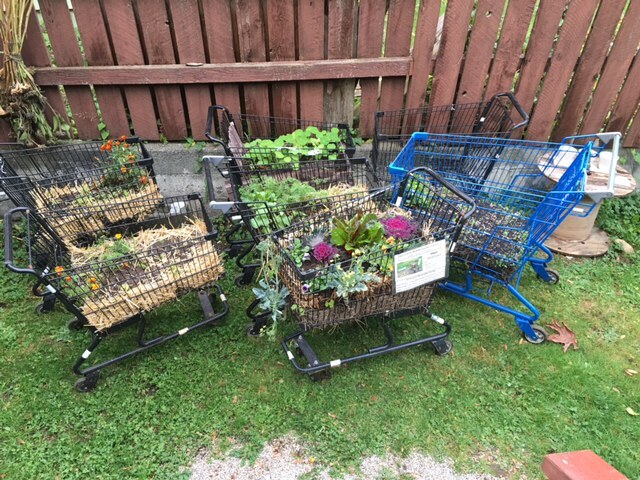 Our Gro-Carts travelled throughout municipalities, showing off radishes, lettuce, kale, spinach, broccoli, carrots, nasturtiums, peas & cabbage. Herbert Gro-Cart & Snoop Dogg Gro-Cart rolled up and down Burnaby Mountain, chatted with families at the PNE, and strolled through New Brighton Park. 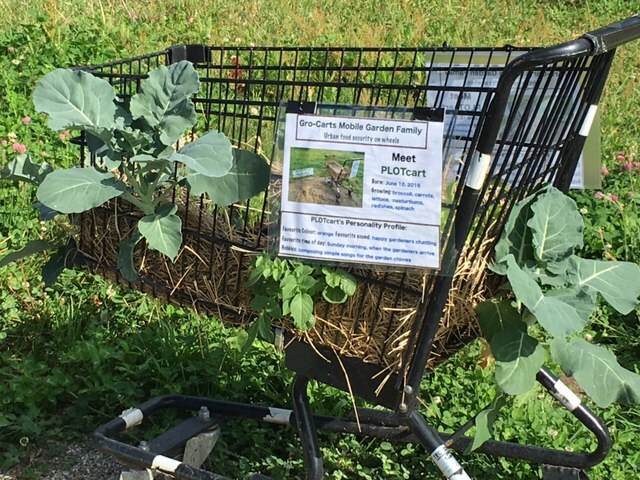 PLOT-Cart made her way to Newton’s community garden PLOT, where she enjoyed a summer parked between the medicine wheel and the field of corn, squash, watermelon and zucchini. Hudson Gro-Cart and several of his friends travelled to their foster home in North Surrey to spend the winter. 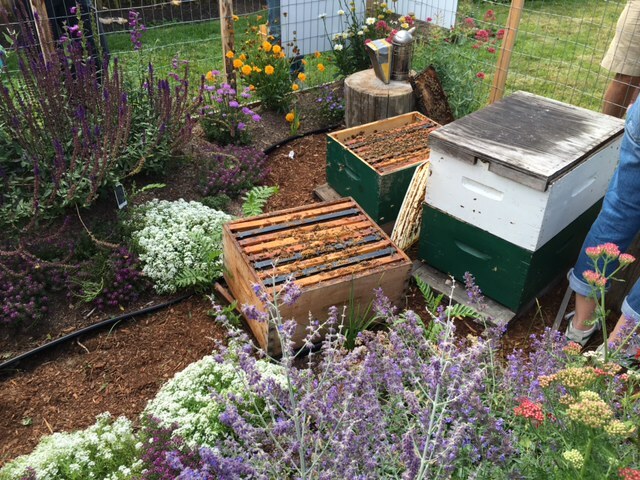 Two Gro-Carts will be rolling to Fraser Heights in early spring, to enjoy a new home that also has a community of bees. 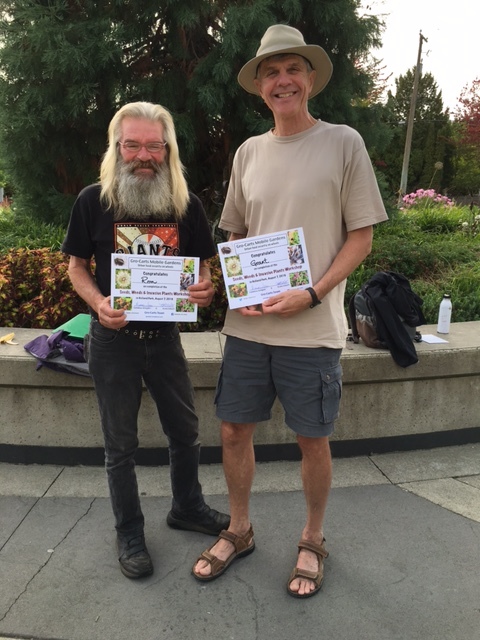 And Herbert Gro-Cart and Snoop Dogg Gro-Cart will continue their literary adventures, joining two Surrey libraries. Where will the next Gro-Cart special event take place? 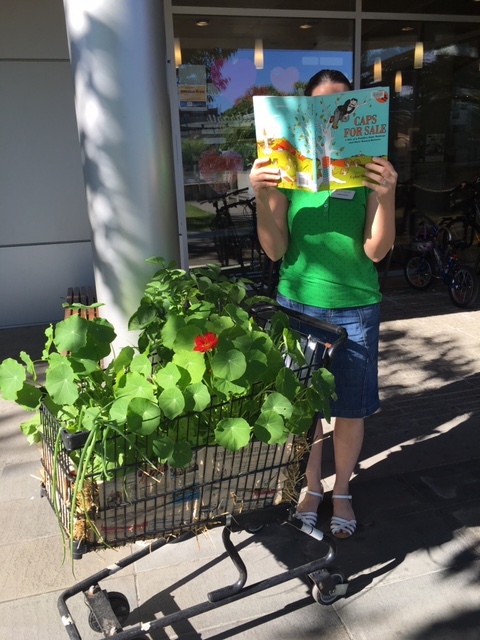 Watch for Gro-Carts rolling to a school or library near you: Spring 2017. 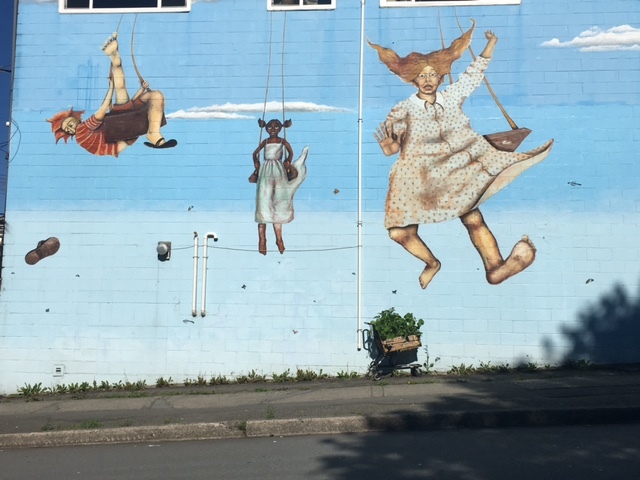 Who’s that enjoying some urban art? 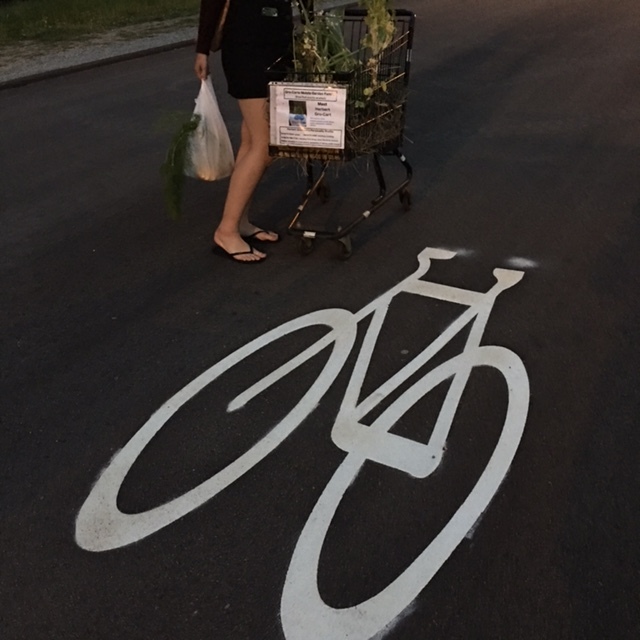 Thanks to all who came Gro-Carting with us! You don’t have to have land — or a grocery cart — to plant food. We hope more people will fill their plates from local gardens in 2017. Eat well, and go out & grow food! Want free seeds? 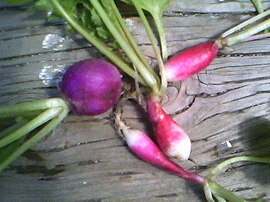 Come to Gro-Carts’ FREE vegetable seeds giveaway. 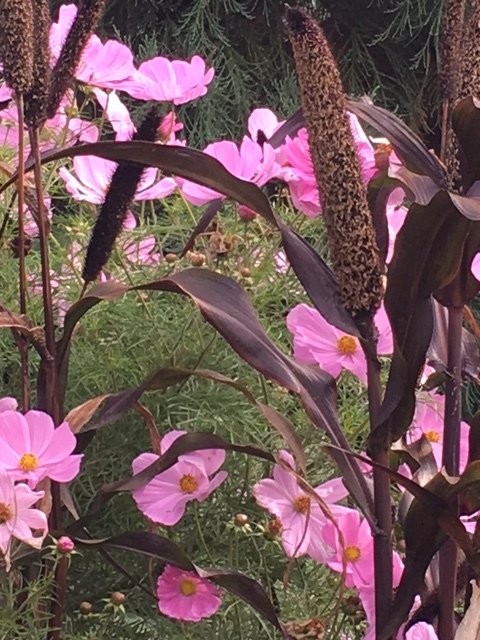 You’ll find us in Holland Park on Sunday, October 23rd, from 1:30pm – 3:30pm. 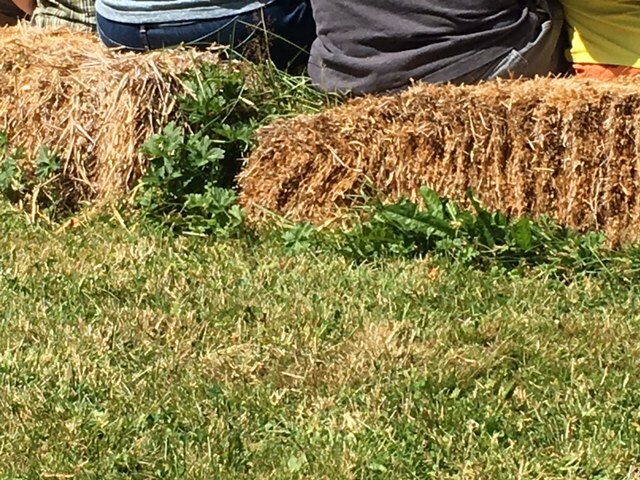 Our seed giveaway volunteers will be wearing these t-shirts. These seed packets are among those that anyone in Holland Park next Sunday afternoon could receive at our final Fall event. But you won’t have to go to the SW corner near the children’s play area to find us. 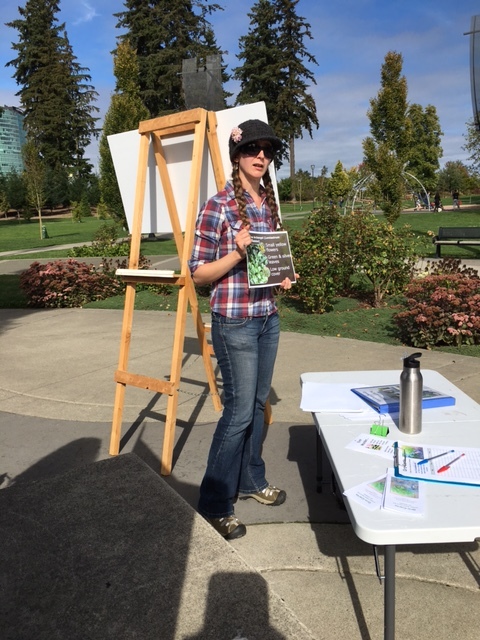 We’ll be wandering around the park in pairs, handing out free seed packets and instructions for planting. How will you find us? 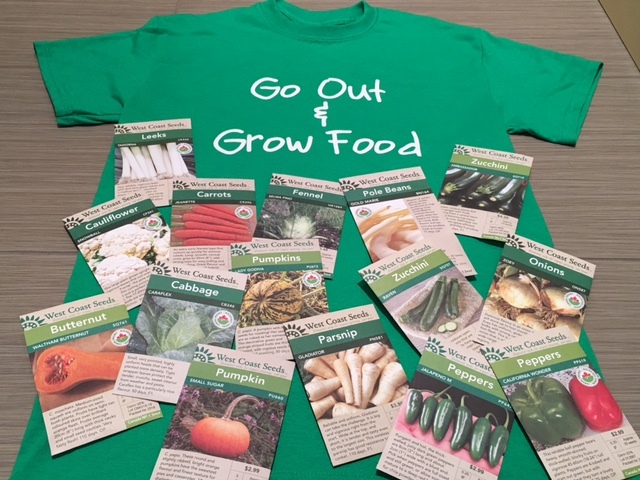 Easy: we’ll be dressed in green t-shirts that encourage people to “Go Out & Grow Food”. — Which is exactly what we hope you’ll do in 2017! 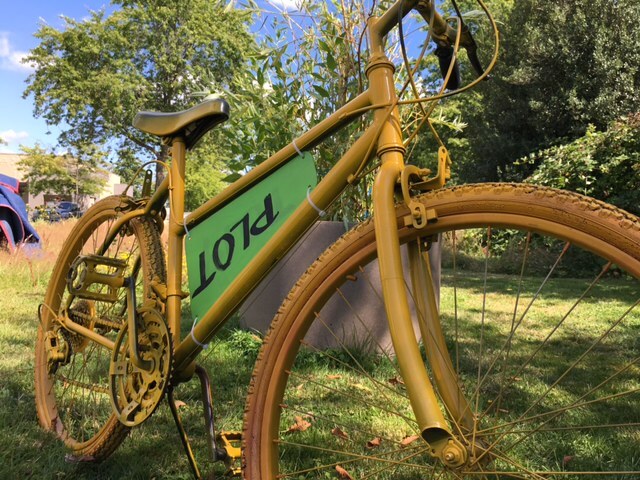 The sun came out for Gro-Carts’ second-to-last meet-up today in Holland Park, Surrey B.C. 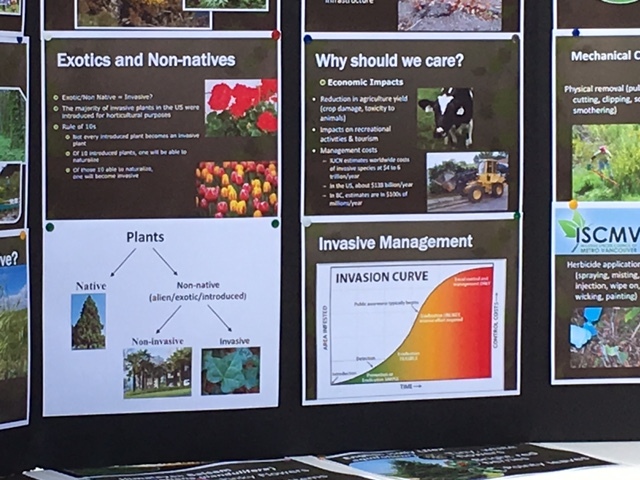 Our two guest speakers today highlighted the role of human response to changes in our environment in their presentations addressing the theme Seeds, Weeds, Invasive Plants & Food Security. Julia Alards Tomalin’s presentation about Invasive Species demonstrated the dangers of waiting too long to deal with plants that could take over a sizeable area. This is particularly worrisome if an invasive plant happens to have toxic properties, like Giant Hogweed. Other invasive plants, like Bindweed, can overtake or strangle neighbouring plants in a very short time. Still others, like Japanese Knotweed, can damage city infrastructure, pushing up through roads and concrete building foundations. If the progress of some invasives is unchecked, they can change the environment of even a forest, endangering the future of trees. 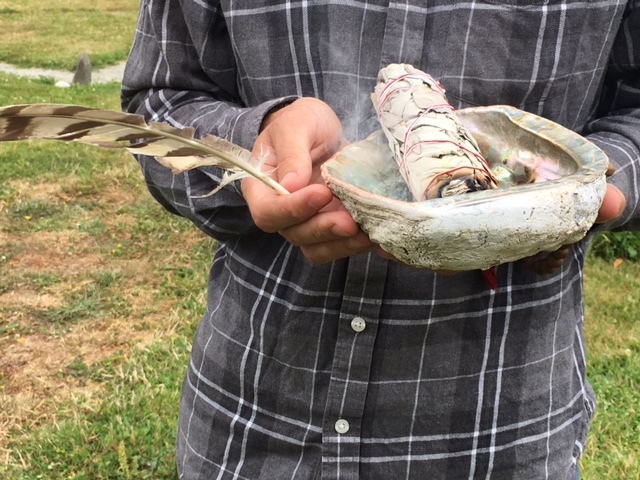 Julia’s work in ecological restoration has demonstrated just how tenacious some species can be. 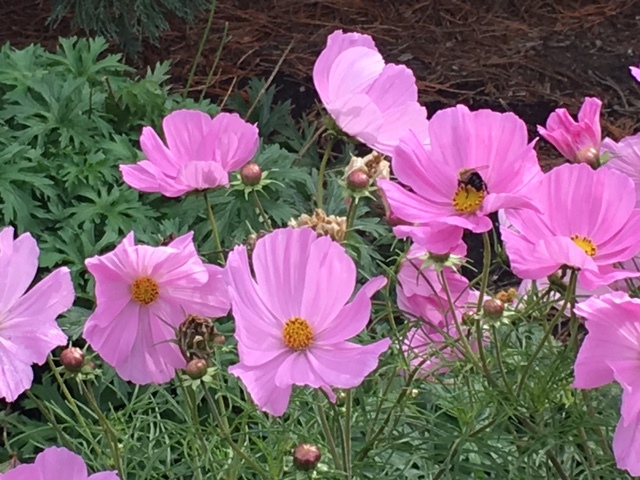 To control invasive plant species, sometimes one has to consider which method will be most effective: chemicals, biologicals (beneficial insects) or simple hard work with hands and shovel. Sometimes choices come down to cost. 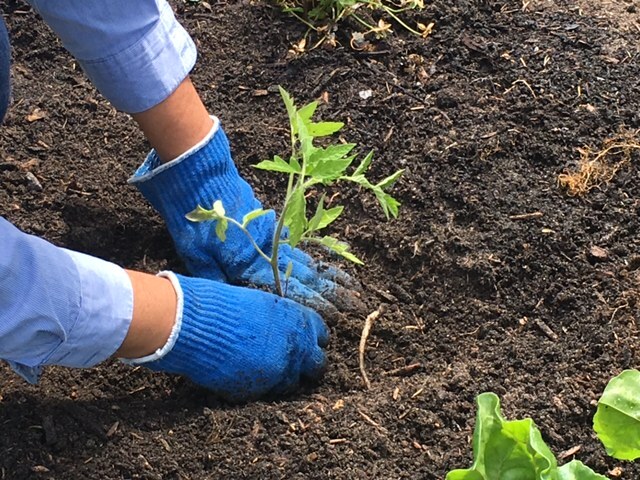 Although it might seem inexpensive to pay someone to remove an invasive plant with hands and shovel, if the plant keeps growing back, this may end up being quite costly in the long-run. 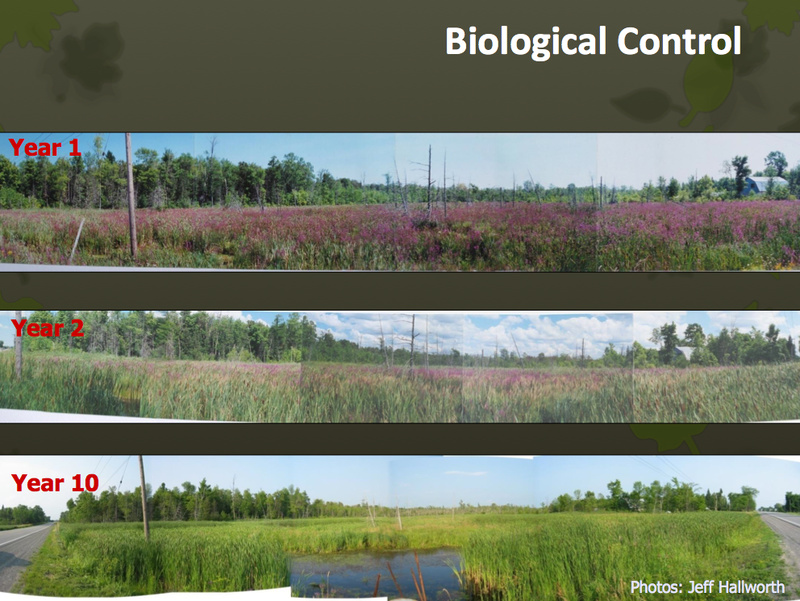 Julia showed images of an area initially crowded with Purple Loosestrife. 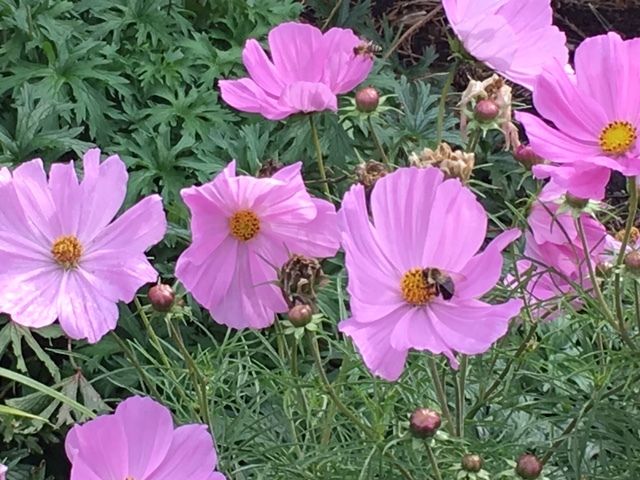 One year after treatment with beneficial insects, purple was still the dominant colour. However, two years later, there was a significant decrease in the presence of the plant. A decade later, almost no purple was visible in the green marshland. Julia explained that biologicals come at a high up-front cost, but that, long-term, they can have the best result. And money and effort are definitely a concern when it comes to invasive species. 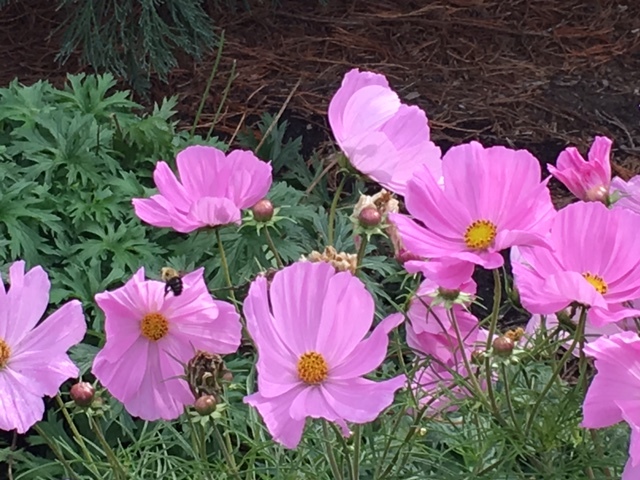 According to the Invasive Species Council of British Columbia, in 2006 alone, close to $7 million was spent on efforts to control invasive plants. According to the Global Invasive Species Program and the IUCN’s Invasive Species Specialist Group, global costs from damage by invasive species reaches into the trillions of dollars. So, what if we add to this the challenges of climate change? 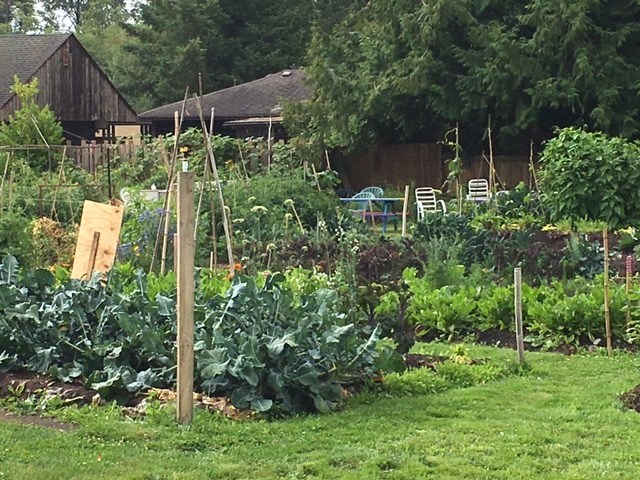 Grant Rice, a champion of food security in the Lower Mainland, has deep concerns about how climate change may limit available food sources at the local level. He discussed the dangers of our over-reliance on California’s produce, a commodity that is quickly becoming more expensive because of the ongoing drought in the state. Water issues are key when considering food security in a warming climate. Grant says that, unfortunately, it’s hard to measure the impact when we don’t always know what we started with. Take the aquifers, for example. According to a BC government site, groundwater is hard to measure because it’s always moving, and is affected not only by human use, but also by precipitation and seasonal melting. According to the site, there are 119 observation wells in BC that have been used to measure trends in water use. However, this is only one metric of many that could be useful in predicting — and protecting — availability of water in the Lower Mainland’s future. In Surrey, for example, household water metering is voluntary. Although it may come at a savings for households to meter their water, unless all homes are metered, we really don’t have a clear indication of overall individual water use. And our household water habits may impact the food that will be available to us in the future. But climate change may make some water far too available to farmland. Rising ocean levels will endanger food-producing land that could end up underwater. 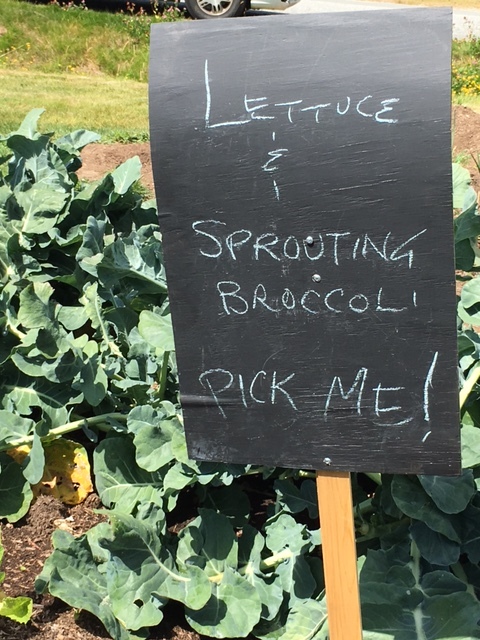 What impact will this have on the Lower Mainland’s ability to feed itself locally? Some regions, like Delta, have already participated in visioning activities to better predict impacts and work on proactive solutions ahead of what is seen as inevitable flooding of agricultural land. But even if water retreats, what it leaves behind is excess salinity in the soil. This will inevitably affect crops. 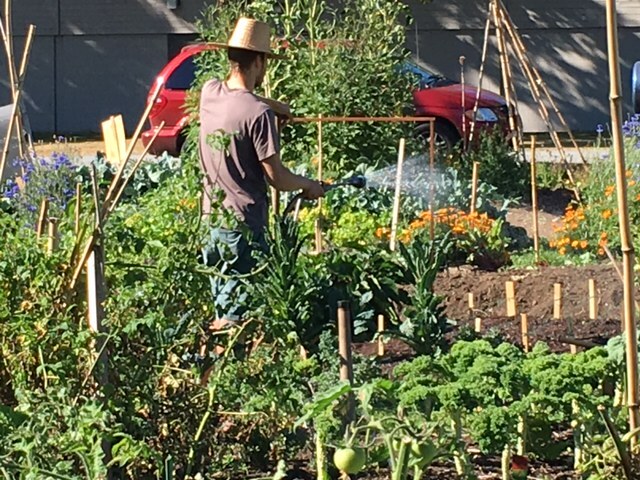 Grant has studied food security in various communities in the Lower Mainland. 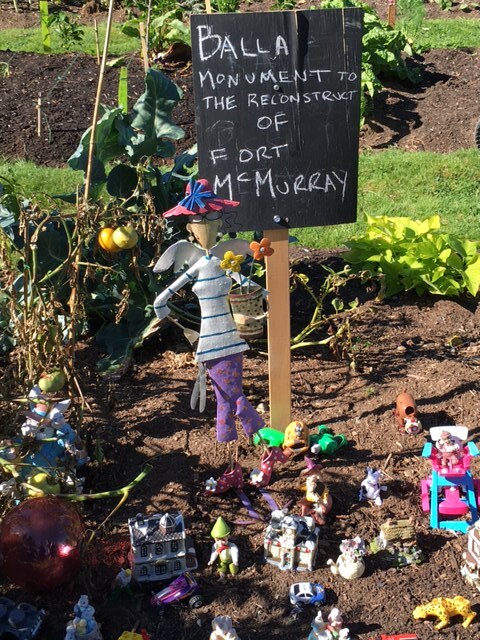 His observations were highlighted in a Vancouver Sun article earlier this year where he was interviewed about the role that community gardens can play in local food security. 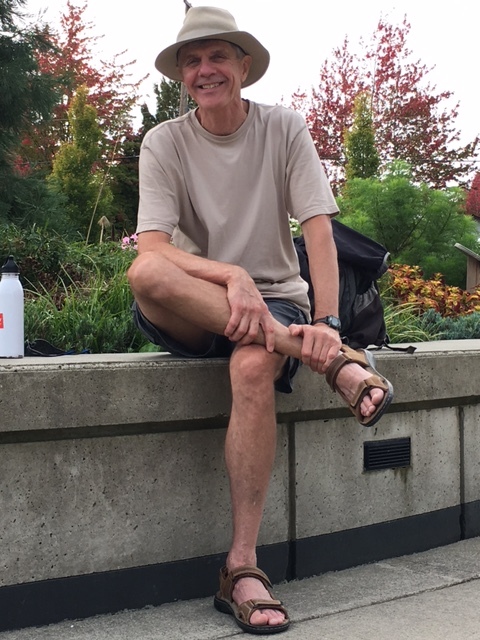 This week, Grant is one of the expert panelists who will participate in a climate discussion (“Something in the Air: Local Action on Climate Change”) in White Rock. Wednesday evening, he’ll join John Clague, Andrew Frank and Gordon Price to discuss ways in which climate change will impact our region. Thanks to all those who joined us at the Gro-Carts meet-up this month! 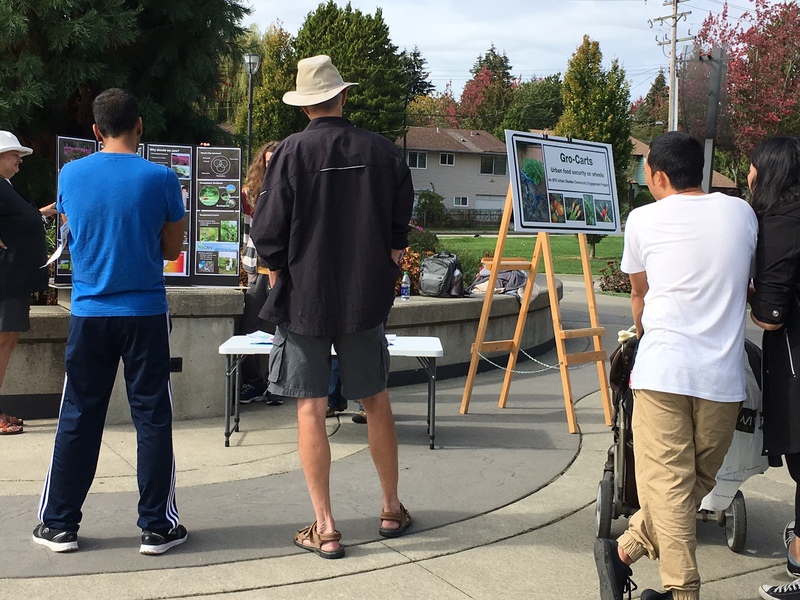 If you haven’t yet had an opportunity to come out for one of our sessions, consider coming to Holland park the afternoon of October 23, for our last Gro-Carts session, Seeding the Future. We’ll be handing out seeds for 2017, and asking people to pledge to plant food in the coming year. 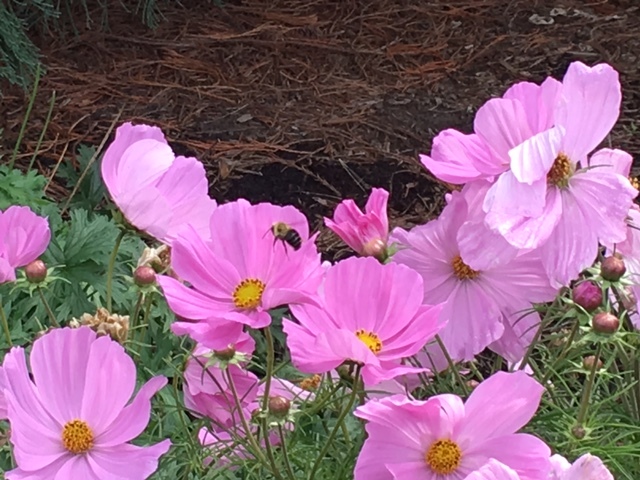 Happy Sunday, Gardening, Plant & Food Enthusiasts! 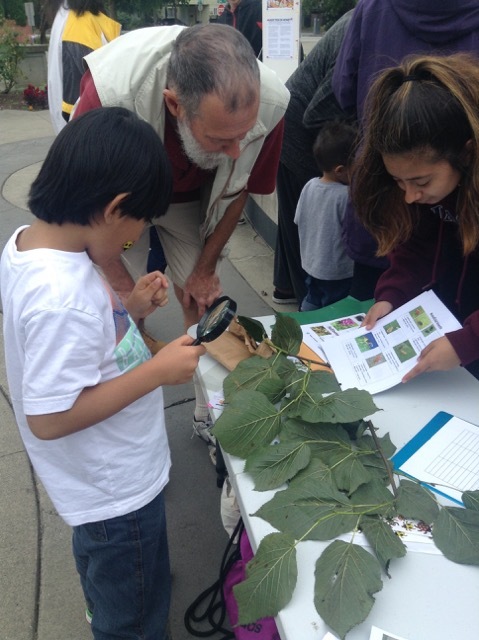 Come join our guest speakers today in Holland Park (1:30 – 3:30pm) to talk about Invasive Plants, Weeds & Food Security. 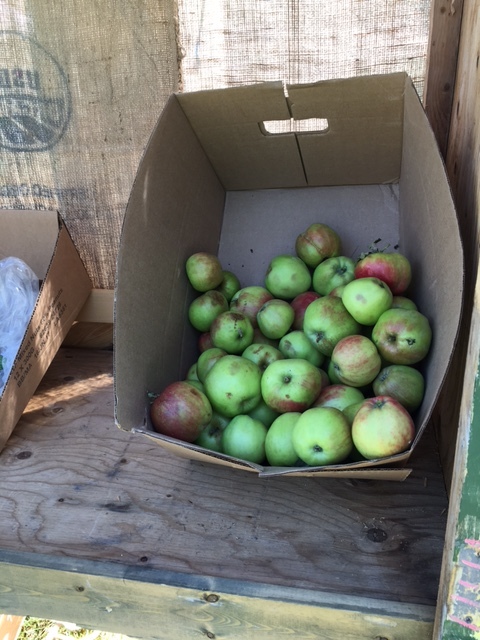 You can also find out what the Gro-Carts family has been harvesting. We’ll be in the SW corner of Holland Park, near the children’s play structures. Can you spell entomologist? Perhaps it’s easier to spell simply “Dr. J”, the nickname of the insect-loving expert at Gro-Carts’ first August meet-up. 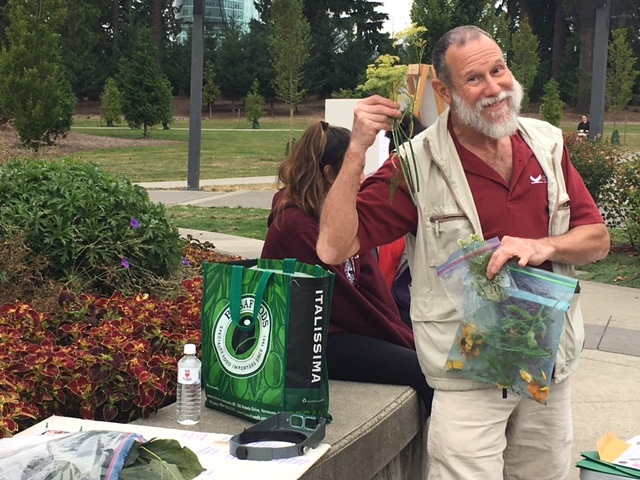 Jim Matteoni was Gro-Carts’ special guest at the Beneficial Bugs Workshop in Holland Park (Surrey, BC). 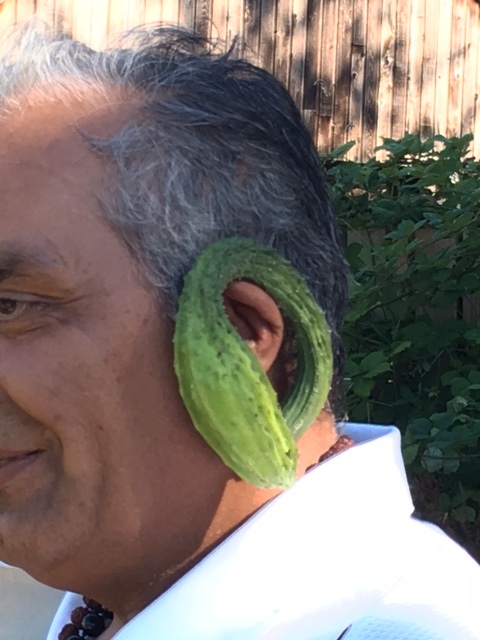 An enthusiastic advocate for helpful insects in the garden, “Dr. J” shared his passion for some of the tiniest creatures looking after our plants. 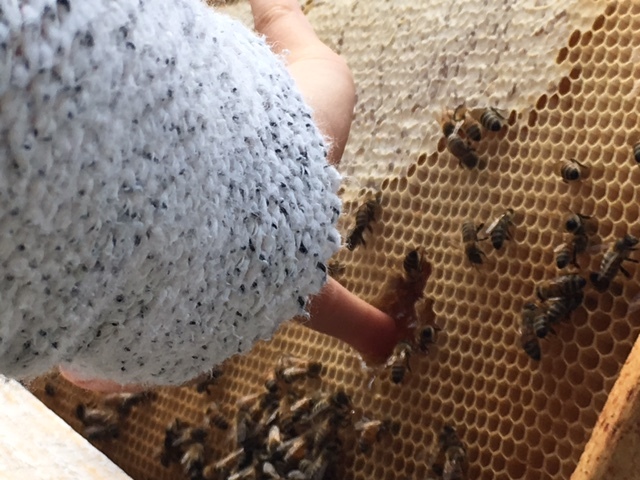 A faculty member at Kwantlen Polytechnic University, he also fielded questions about KPU’s new Commercial Beekeeping Program, which will graduate its first class of beekeepers this year. 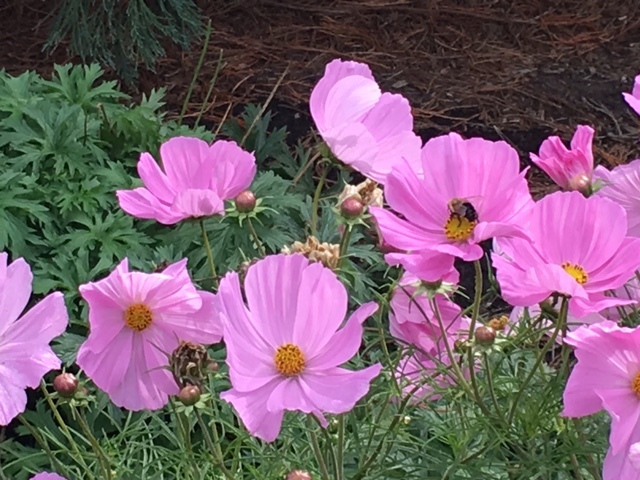 As well as being an expert on bugs, Matteoni is a horticulturist, and has also acted as a type of “plant coroner”, teaching students to examine plants to find the cause of death, a role that earned him the nickname “Dr. Death”. 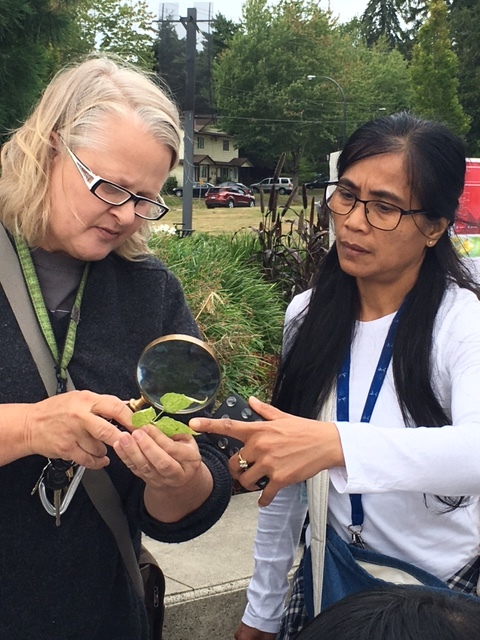 Participants at the Beneficial Bugs Workshop examined a number of insects that help keep our plants healthy. 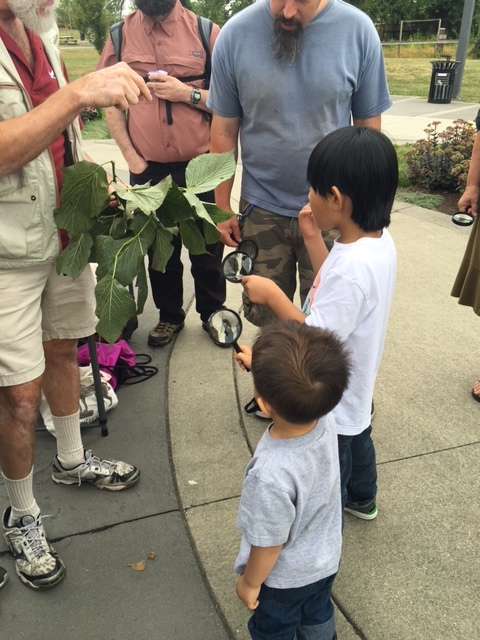 Because these tiny gardeners are so difficult to see, participants examined them with magnifying glasses. 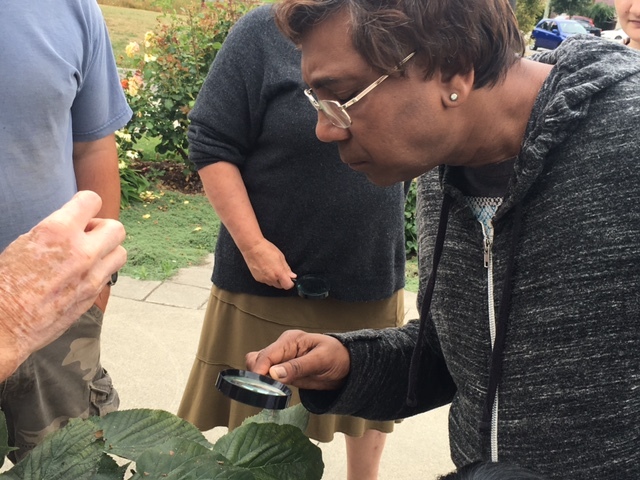 Both Dr. J and Gro-Carts’ own horticulturist, Tammas Grogan, helped budding insect-detectives spot and identify the different critters, and explained the role they play in warding off harmful insects in the garden. 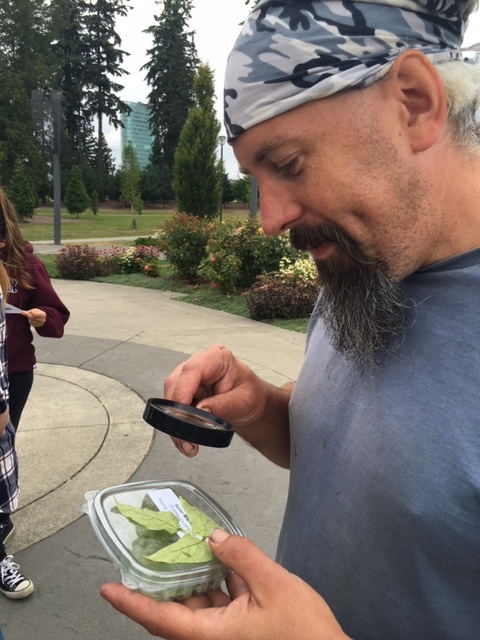 One of the highlights of the meet-up was the release of the ladybug larvae. These don’t look much like the stereotypical round-shelled, polkadot insects we might automatically think of. In fact, Matteoni refers to the spiky little critters as red and black crocodiles. A ladybug’s life cycle has multiple phases, and the black-spotted red ladybugs we recognize are the older and wiser phase. — They are also less hungry. Ladybugs eat aphids. 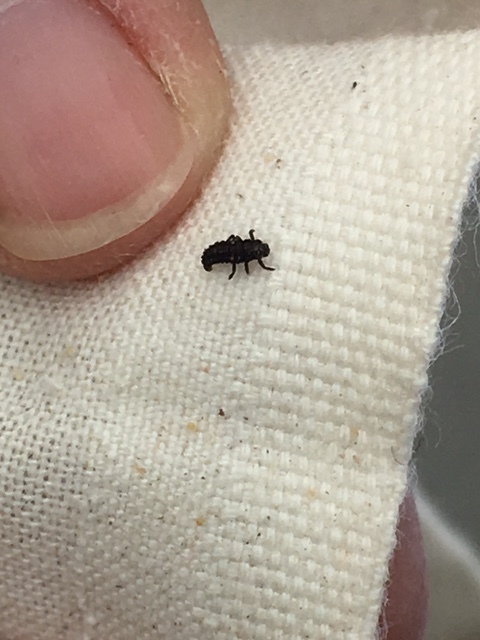 This is useful, as aphids tend to roam around gardens sucking sweet juices out of plants. 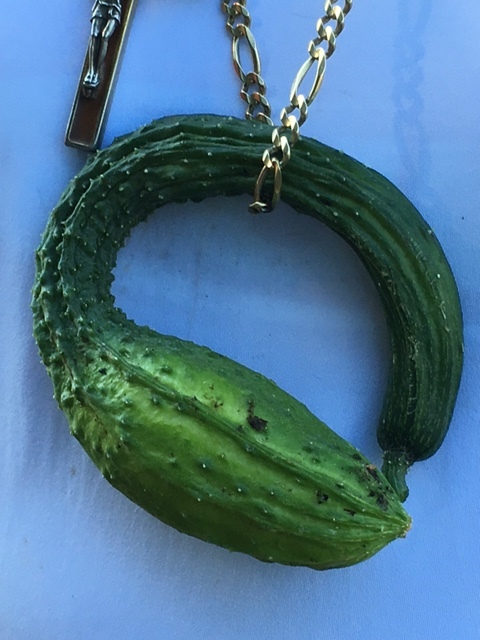 No one really wants to have their juices sucked out, so this can have a rather unhealthy impact on a plant. 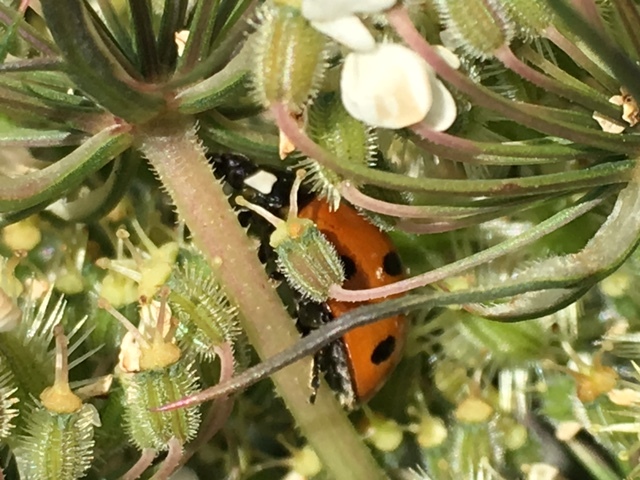 However, it also makes the aphids (which are tiny, black specks) nice and juicy: a perfect meal for a ladybug. 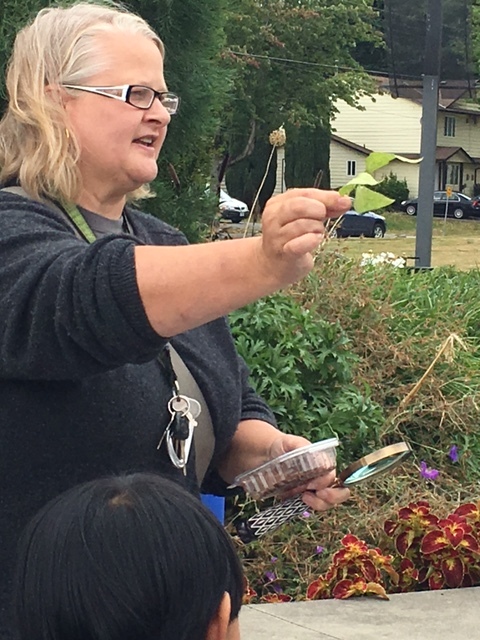 … and showed participants how to spot the helpful insects. 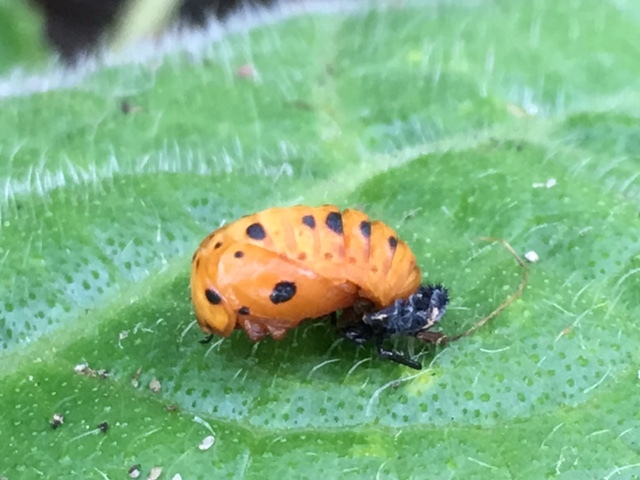 Both the larval and adult stage ladybugs eat aphids. But the larvae, fast-growing and in need of more nourishment, are hungrier. This means they eat a greater number of aphids. But there’s another reason for introducing ladybug larvae into your garden instead of “adult” ladybugs: wings. Larvae don’t have wings, and can’t fly away. Adult ladybugs, however, fly wherever they want. — Who hasn’t made a good-luck wish on a ladybug as it flies off? 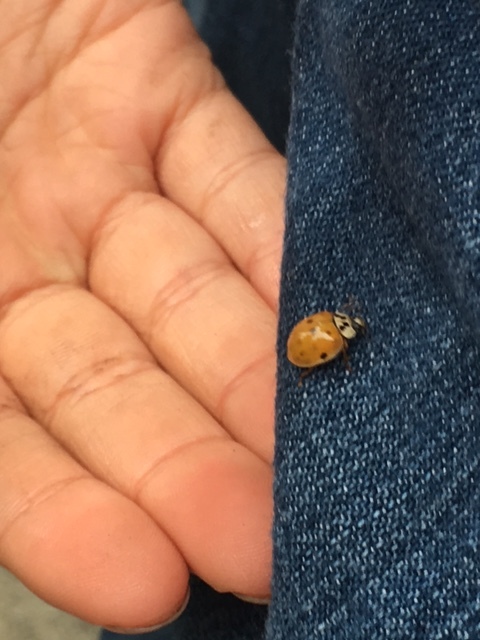 Imagine the disappointment of the gardener who releases adult ladybugs in his garden, only to have them fly away to eat aphids in another neighbourhood! 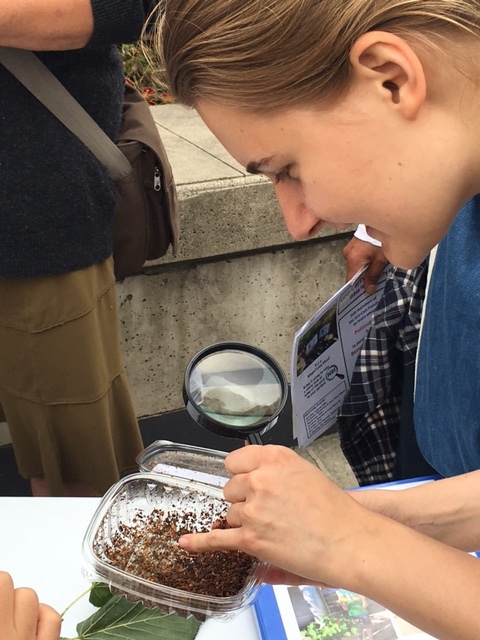 Gro-Carts avoided disappointment by releasing ladybug larvae. 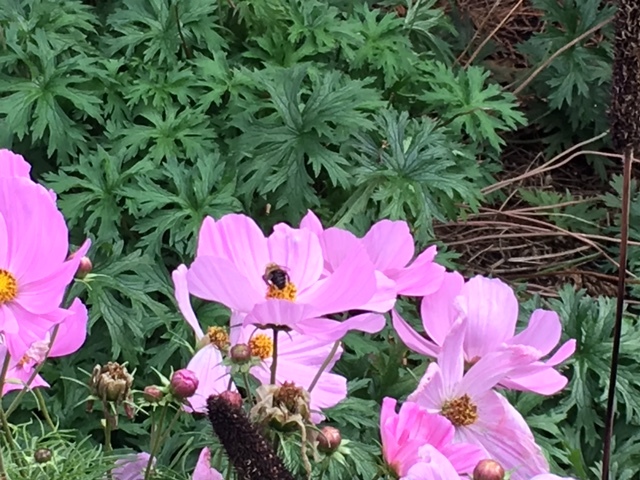 Can you spot the ladybug larva and the adult ladybugs? Two weeks ago, Herbert Gro-Cart went for an evening roll with some human food-security friends. Herbert Gro-Cart’s August produce: onions, rhubarb, cabbage, and some nasturtiums. 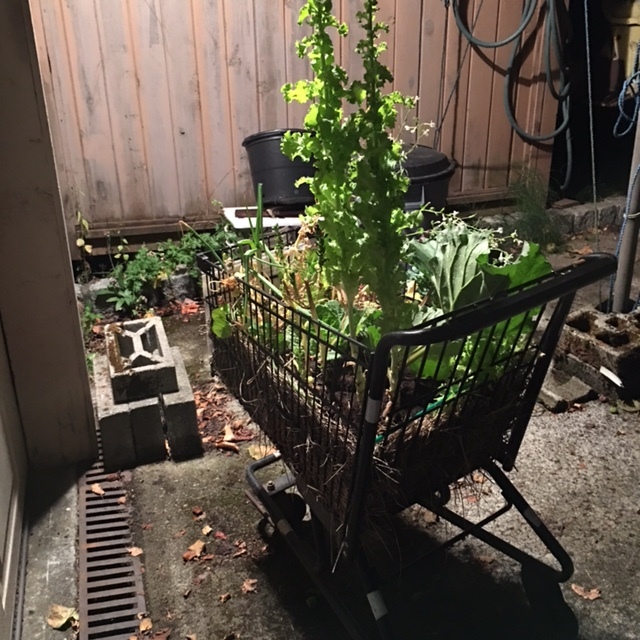 As the company was good, and Herbert’s cabbage and rhubarb were drawing both attention and compliments, the Gro-Cart and his humans stayed out past sunset. This meant rolling home in the dark. 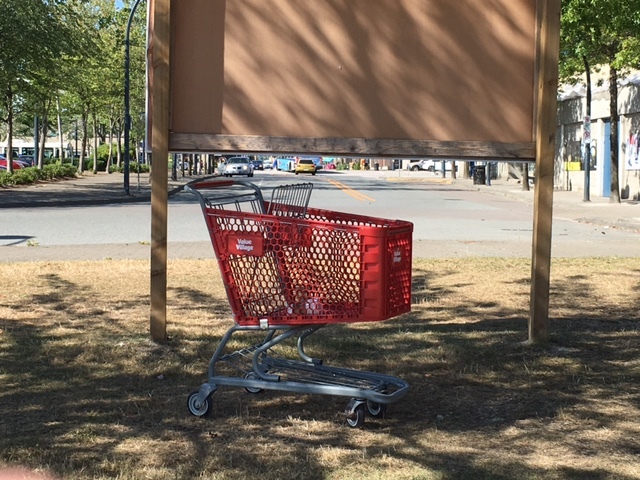 Gro-Cart Conundrum: Once again, Herbert wonders if he is to roll on the road, like a bicycle, or accompany his footed-companions on the sidewalk. Herbert Gro-Cart was shocked to find his humans woefully unprepared for a walk at night. Whereas Herbert’s reflective tape alerted drivers, cyclists and pedestrians of his presence, his two-footed companions were dressed in dark colours, and wore neither lights nor fluorescent indicators. 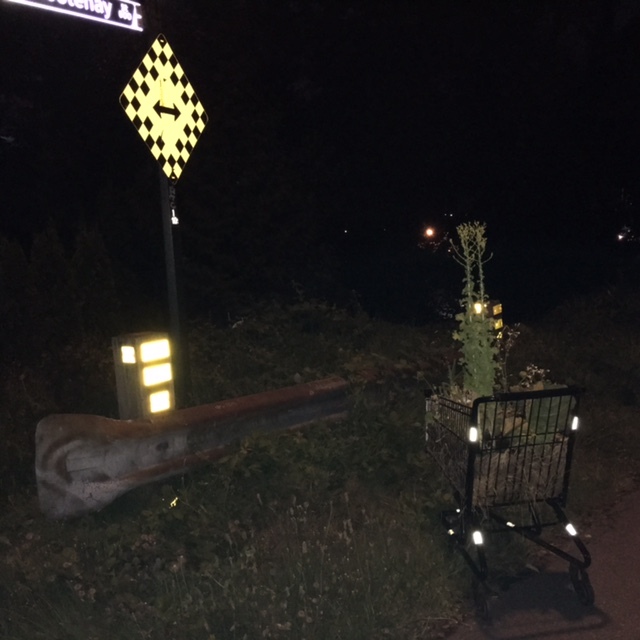 Herbert Gro-Cart, like any sensible creature at night, uses reflective tape to ensure he is visible to road and sidewalk traffic. 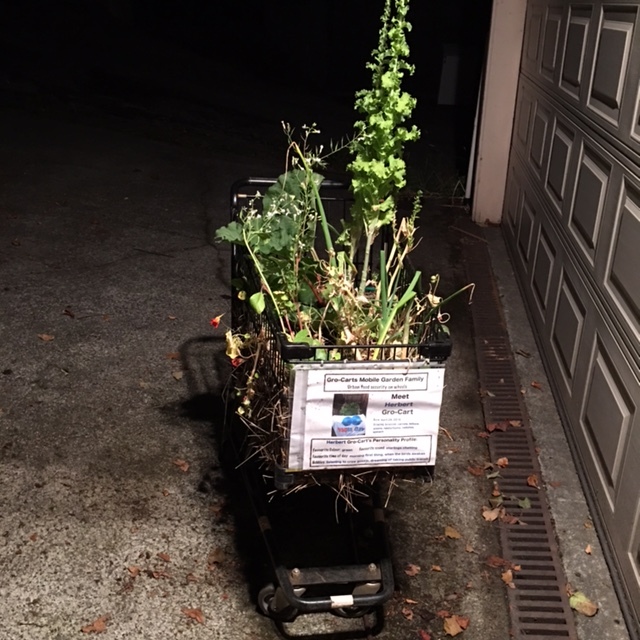 Thankfully, Herbert Gro-Cart accompanied the humans safely home, thanks to his good preparation for night-time visibility. Door-to-door service: Herbert Gro-Cart accompanies his human companions home in the dark to ensure their safety. Herbert would like to remind all two-footed creatures of the importance of taking precautions when walking, strolling or rolling at night. Like all Gro-Carts and street signs, humans should likewise wear something reflective. This is only fair to drivers and cyclists, who then have time to make wise decisions and safe manoeuvers. 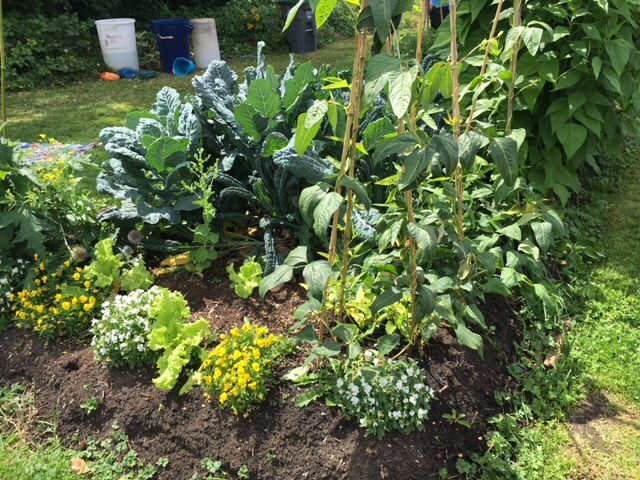 The PLOT is, without a doubt, proof that local food security is possible where land is available. Each time Gro-Carts visits the PLOT, the corn is higher, the produce is bigger, and the variety of vegetables is greater. Brightly coloured round and oblong shapes appear along vines and beneath the garden’s foliage. Nutrition abounds. 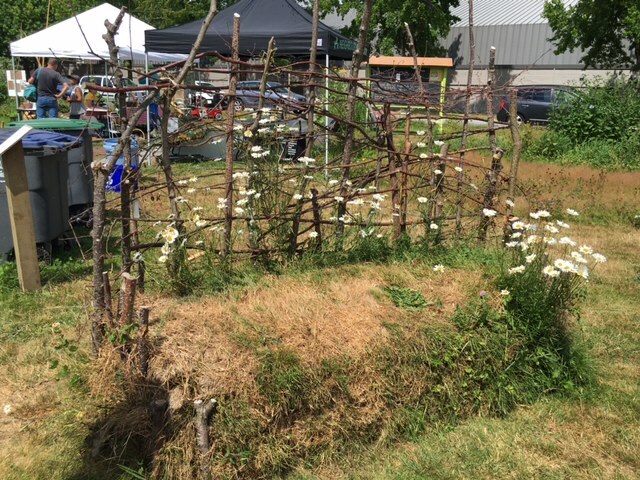 This ever-changing, ever-growing piece of land is a community garden in the truest of senses: the work is shared, the land is shared, the harvest is shared. 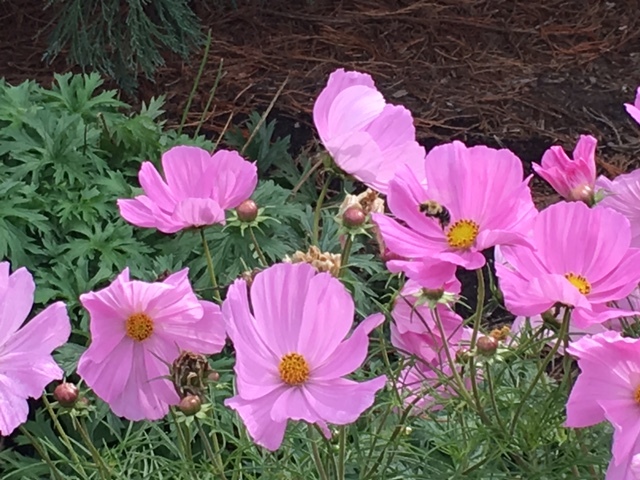 There are no demarcated sections, no signs warning: “Please don’t pick what you didn’t plant.” There is no “Mine”, only “Ours” — the “ours” that is the human community visiting the PLOT. No passport or visa control, no fence nor gate, no opening and closing hours. 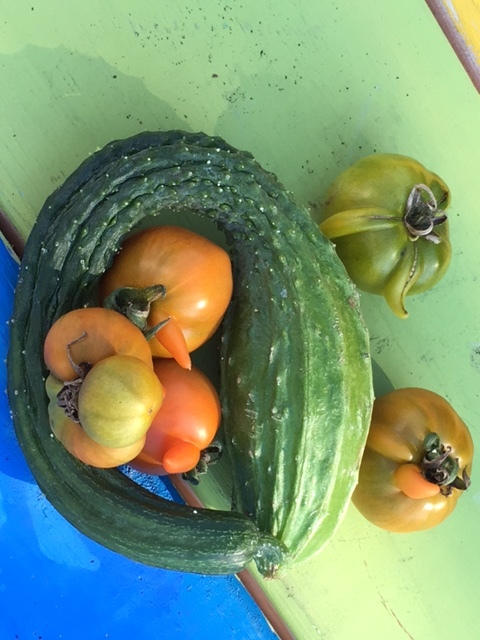 This fertile patch of land has produced, under the guidance of loving green-thumbed humans, a cornucopia of vegetables and fruit, free for the taking. The only caveat? 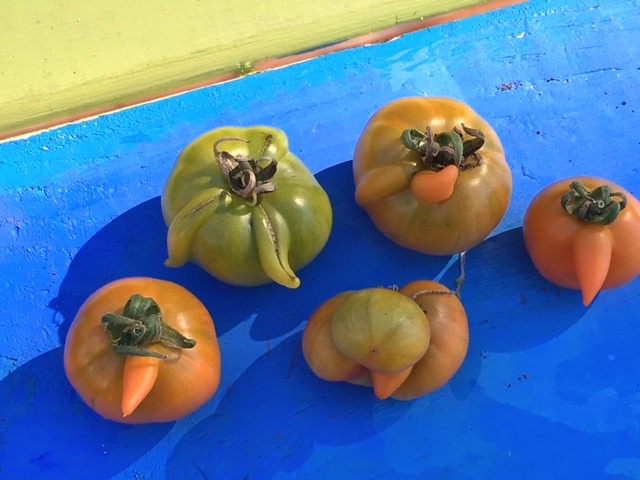 Please pick only what is ready to be harvested. 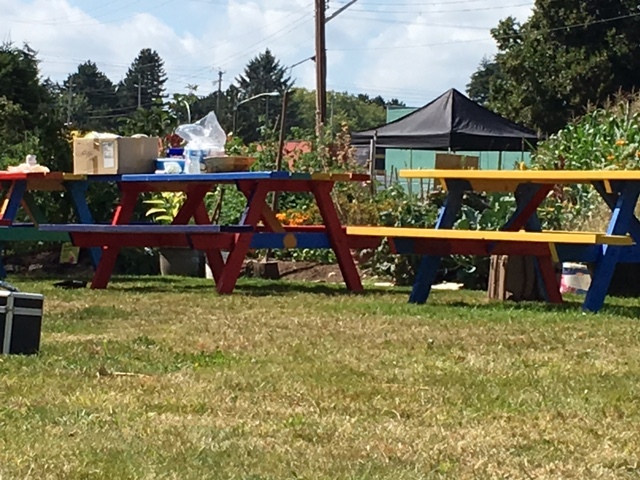 At the end of July, Gro-Carts was privileged to be included in a PLOT celebration of community. 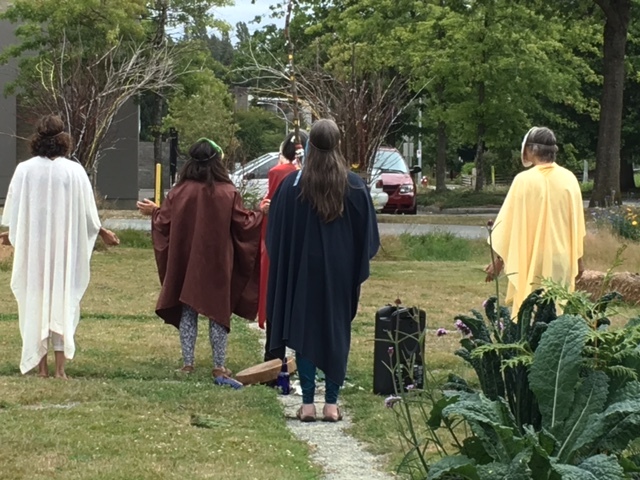 From the Medicine Wheel ceremony and smudging to the storytelling and craft-making, there were activities for all members of the community. 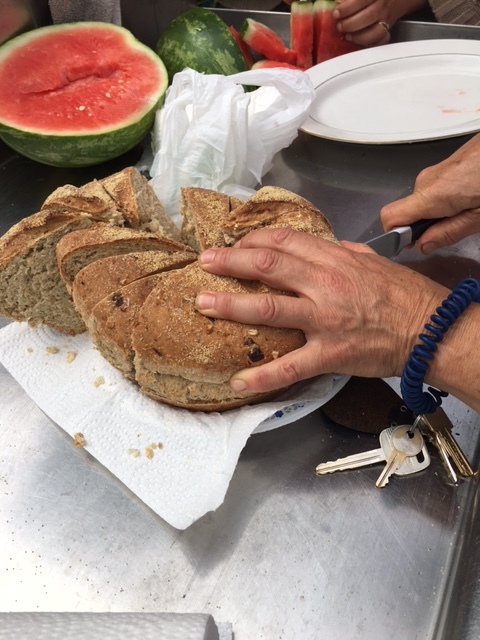 Above: Homemade bread and fresh produce from the PLOT were a delicious part of the community meal. Below: Live music ignited smiles and dancing feet. 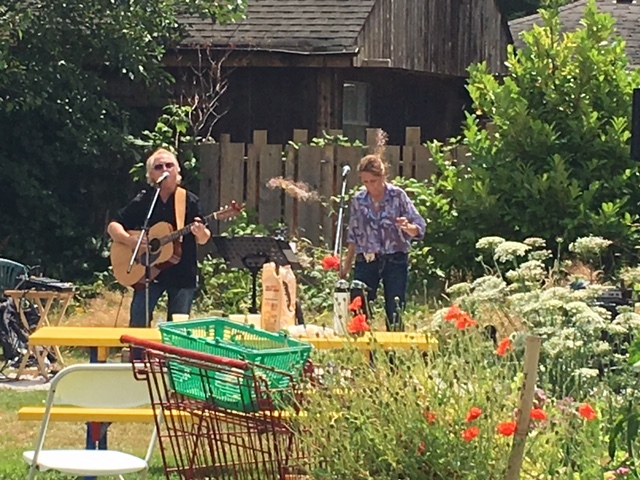 Gro-Carts happens to be crazy about bees, so we were thrilled to see the open hive demonstration at the PLOT’s apiary. 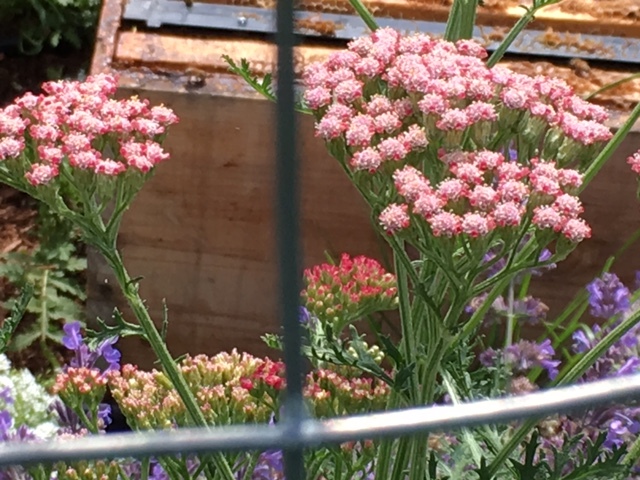 The two active hives, donated and cared for by The Honeybee Centre, are in a protected bee garden, filled with bee-friendly plants from sponsors such as Hunters Garden Centre. 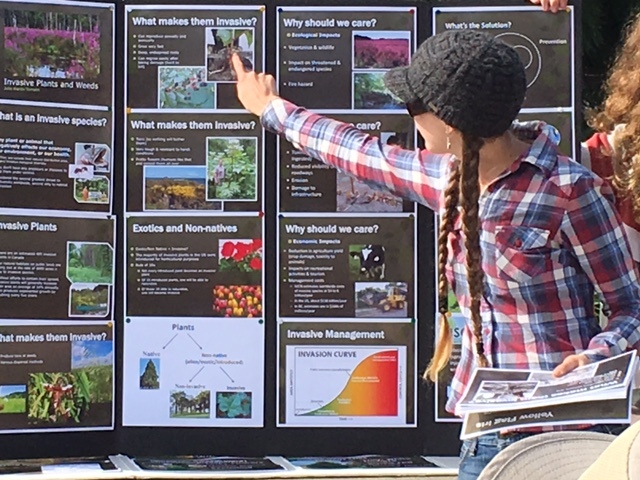 At the PLOT apiary, Honeybee Centre volunteers offered several easy educational tips on how to help out honeybees in your neighbourhood. 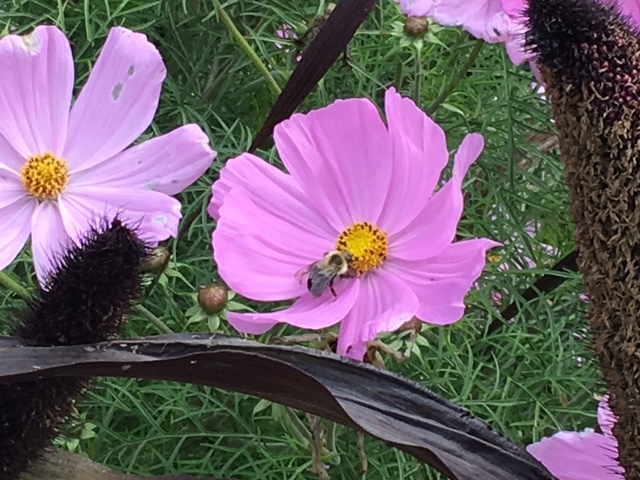 During a honeybee’s life cycle, it will be assigned different roles. The role of foraging for water is of vital importance. However, collecting water for the hive can be a life-threatening experience. 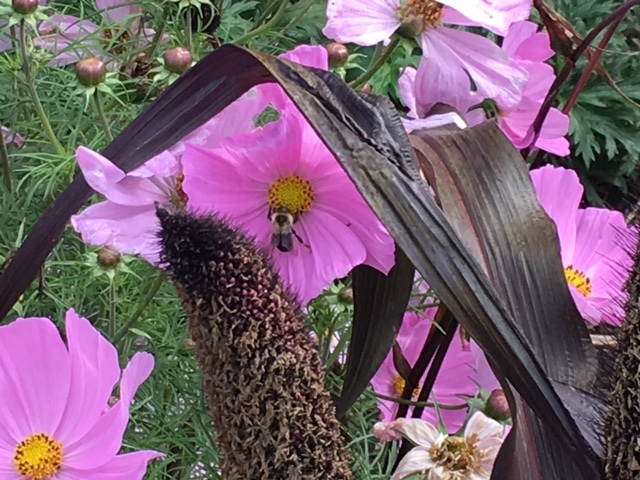 Many bees drown attempting to complete this task. This may be one reason you have found dead bees in an outdoor swimming pool. Bees cannot land directly on the water. To drink safely, a bee needs a safe perch floating on the water. 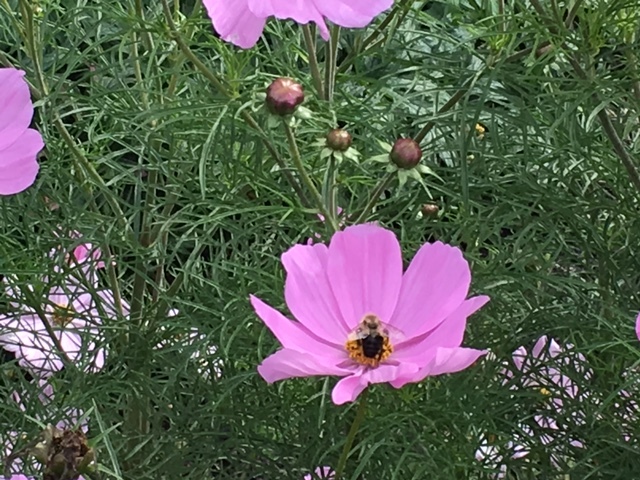 This way it can land, drink, and fly safely back to the hive. 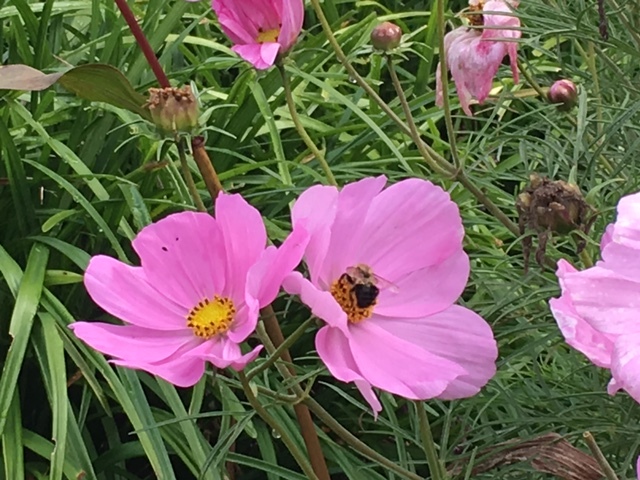 The Honeybee Centre recommends ensuring there are bits of twigs or leaves in your birdbath, water fountain, or even in a shallow dish of water on your patio. This will offer visiting water foragers a safe spot to carry out their important work. 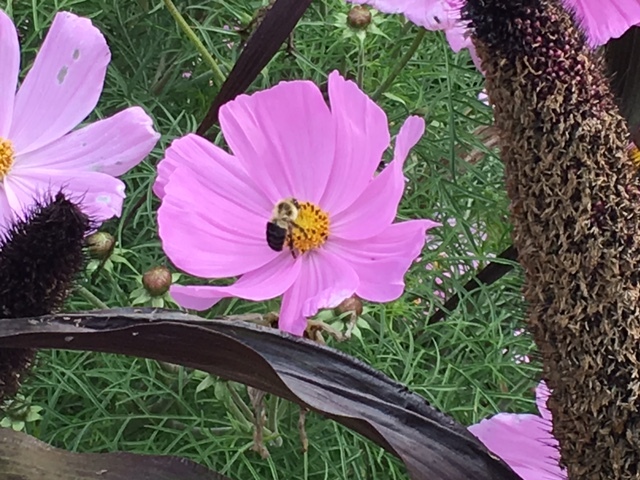 Mid-August, Gro-Carts visited the PLOT once again to see what the bees were up to. 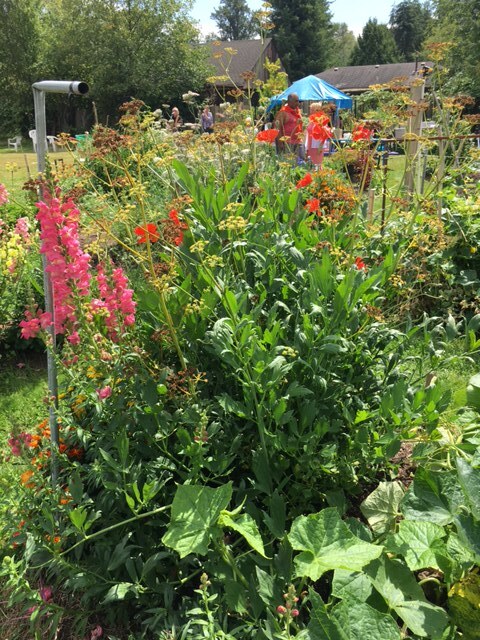 We were also pleased to introduce our own Guerrilla Gardener to some of the PLOTters, and to show off the food that can be grown on a slice of unused land. The PLOT is filled with stories; one has only to look. 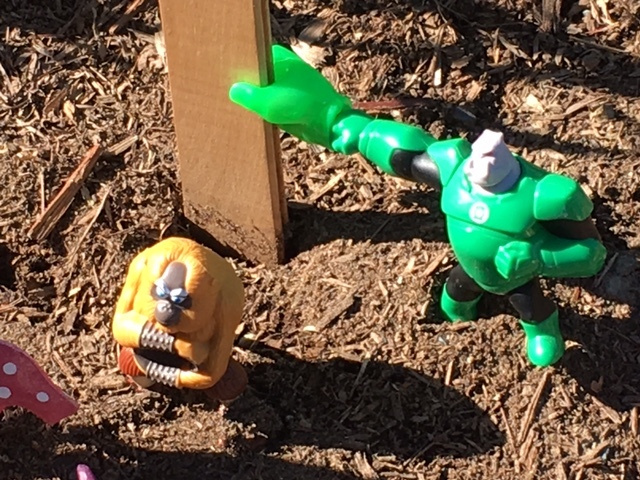 These critters are the guardians of Balla’s newest addition to the PLOT. 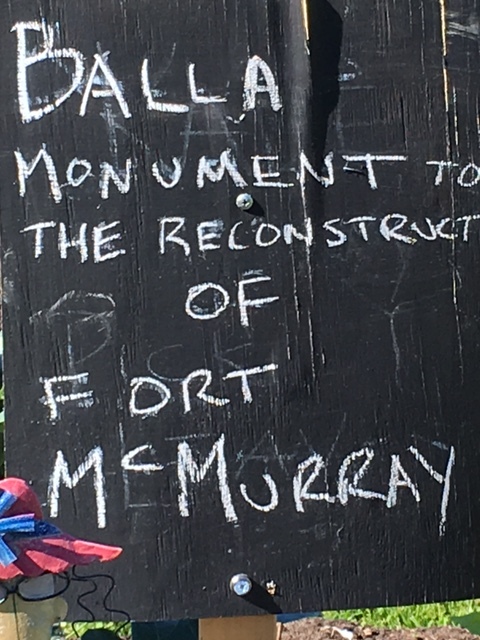 Among the new additions to the garden was Balla’s monument to the reconstruction of Fort McMurray. 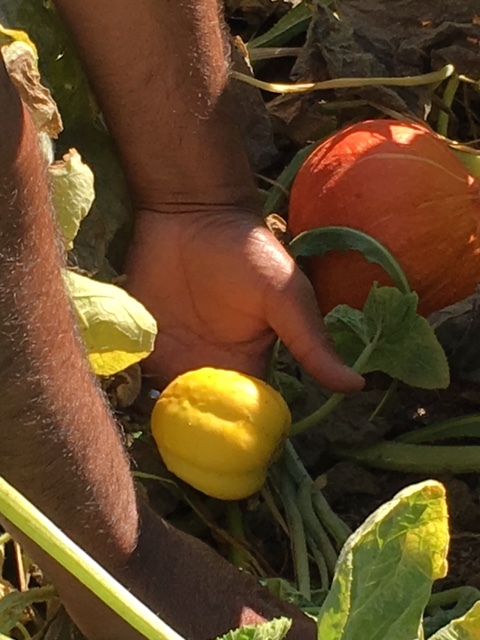 Balla, one of the PLOT’s stalwart volunteer gardeners, showed off some of the PLOT’s most beautiful and unique (or “ugly”) vegetables. 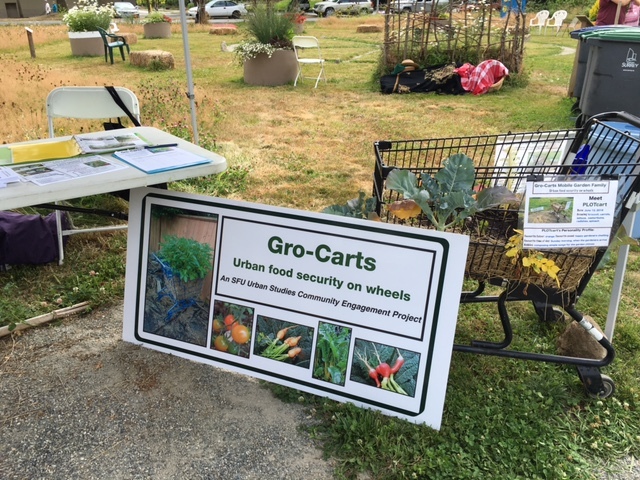 Gro-Carts was pleased to use these to promote the #UglyFood campaign spearheaded by the people at Ugly Fruit & Veg. 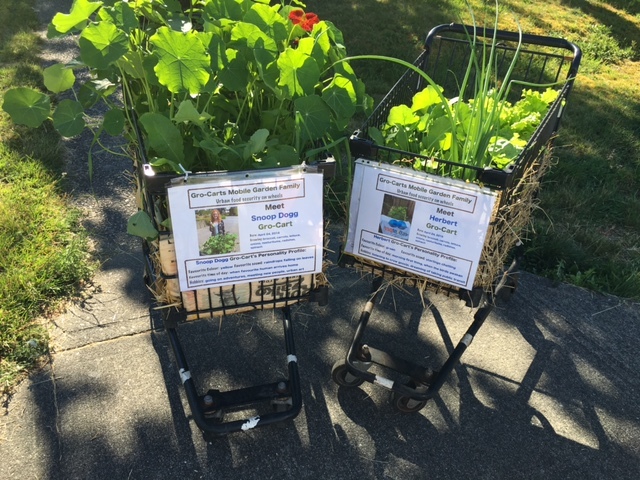 Gro-Carts encourages anyone passing through Newton to visit the PLOT. 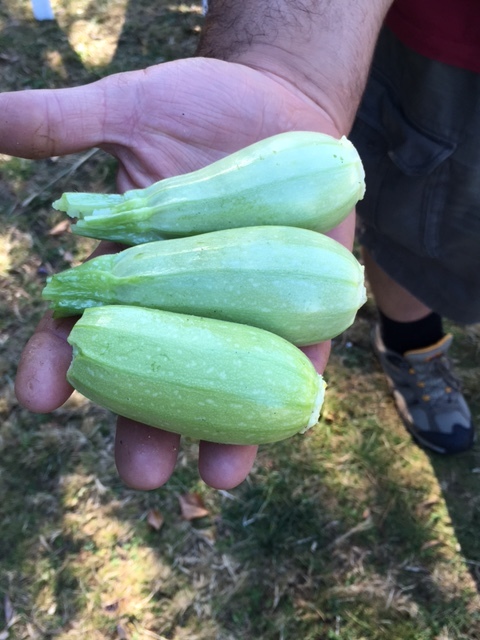 We challenge you to count (and identify) the types of vegetables and fruit growing there. 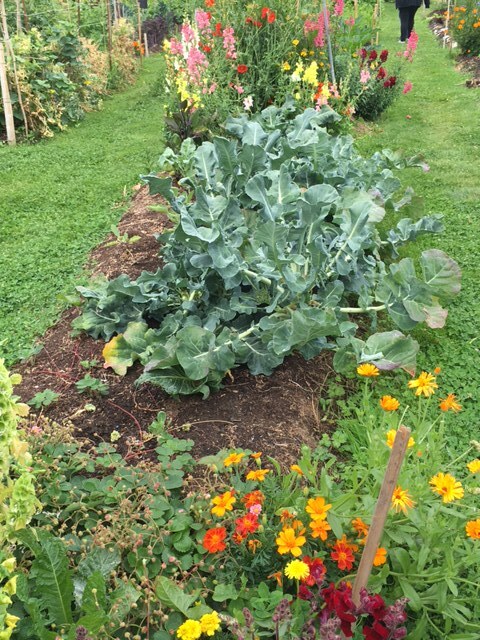 As the PLOT welcome sign indicates, it is a “Sharing Garden”, so feel free to harvest whatever you can eat — as long as it’s ready to be picked. 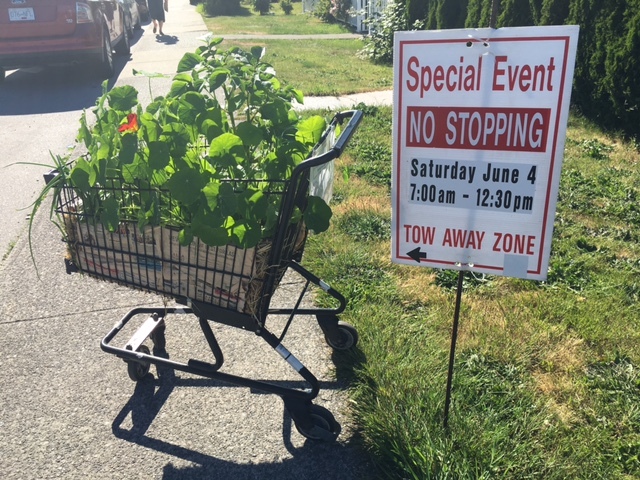 While you’re there, please say hello to PLOT-cart, stationed in its own parking spot by the entrance to the PLOT. Don’t know how to find the PLOT? It’s located behind the Newton Exchange bus loop, by the Newton Wave Pool/Newton Recreation Centre.